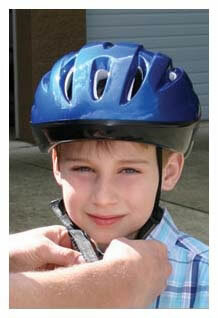 Bicycle helmets prevent head injuries. Just a few minutes learning some bicycle safety rules and how to properly wear a helmet can make someone safer for life. Fire District 6 offers free bicycle helmets courtesy of grants from SW Washington Medical Center Trauma Services and Wal-Mart. These helmets are available to children with income limitations. Sometimes getting the proper fit can be a challenge. Bring your helmet to the fire station on Hazel Dell Avenue for assistance. A bicycle rodeo is a road course set up for children to practice riding their bikes using the rules of the road for bicyclists. Children receive safe bicycling training then ride their bikes through a road course that includes road signs. Oftentimes just telling children how to be safe has less impact than if they can actually practice it. Bicycle rodeos have taken place at elementary schools, Wal-Mart bike safety events, and the Boys & Girls Club. Bike rodeos are available for groups of 20 or more.